The Golden Eagle is considered one of the most recognized and prestigious birds in the world. It is also considered to be one of the largest birds of prey in the world. The Golden Eagle is a very shiny brown that looks somewhat golden during the day when the sunlight is upon it. They also have feathers on their legs so this is a simple way to tell them from the Bald Eagle. The tail has dark plumage on it. This is where the name of this particular Eagle comes from. They can grow to a size of about 3.25 feet in length with a wingspan of up to 7 feet wide. They may weigh up to 14 pounds. 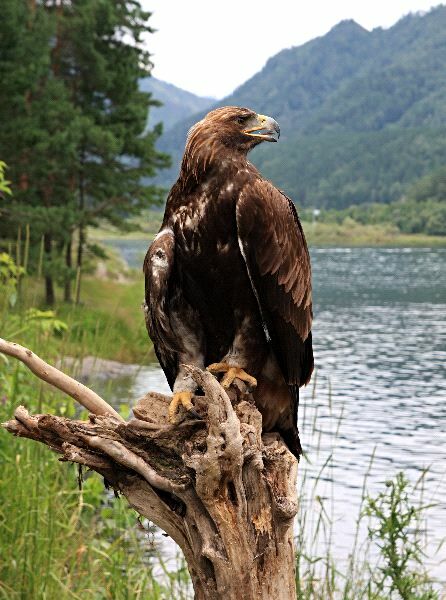 The Golden Eagle is found in regions all over the Northern hemisphere. They are found living around mountain regions, the prairies, and along rugged terrain. They are very adaptable to various climates and environments. Europe, Asia, and the Northern part of Africa are the most common areas for the Golden Eagle to be found. They are very solitary birds and you will find them in very remote locations. They don’t create flocks in the winter months either which is the case with so many other types of bird species. Some of the Golden Eagles do migrate in the winter though due to a lack of food in their natural habitat. Those that are able to maintain a food source though are likely to stay in their home all year. The Golden Eagle hunts a home range that can be up to 162 square miles. They consume a variety of small mammals that eat grass. This is very important because it has prevented these birds from getting poison due to various pesticides, herbicides, and other elements that the prey of various birds have consumed. When they have to, as a last resort, they will consume carrion which are remains other predators have abandoned. They are mature for mating when they are about 4 years old. They will choose their mate and often go back to that same mating year after year. They will create a nest on the edge of a cliff or high up in a tree. That location though is where they will often go annually to meet up with their mate again. If that habitat is destroyed it could result in that pair not mating at all for several years. The female will offer a clutch that can have from 1 to 4 eggs in it. The incubation period is from 35 to 45 days. The female will stay with the eggs while the male brings back food for her. When the chicks arrive the parents will take turns staying with them and bringing back food. As they get older they will be left alone while both parents are out getting food. When the young are about 10 weeks old they will leave the nest and be on their own in the world. In the wild they can live for a period ranging from 32 years. The Golden Eagle is well protected due to the limited number of them in the wild. It is illegal to hunt them, to possess their feathers, or to have them as pets. The penalties in the USA can include a fine up to $10,000. There are breeding programs in many locations to aid in increasing their overall population. Still, it is a long road to getting them to where they can thrive as they once did.